This lecture will take a look at the core set of nodes that Node-RED installs by default and then show you the extended set of nodes that the cloud-based Node-RED service – FRED – supports. For each node, you’ll see a brief overview of its functionality and an indication of which example in this lecture series uses the node, so you can look in more detail at how to work with the node. This lecture is mostly a reference section. However, it is worth looking quickly through the nodes, so that you have an idea of the basic functionality available to you as you begin to craft your own flows. When you install Node-RED for yourself on a device such as a Raspberry Pi or Beagleboard, it starts up with a default set of nodes. There are 8 main categories of nodes in the default install: inputs, outputs, functions, social, storage, analysis, advanced and Raspberry Pi (See Figs 4.1 and 4.2) Let’s take a look at each category in turn. Figure 4.1 The default input, output, function and social media nodes. There are 7 basic input nodes installed by default. They cover the basic communications mechanisms that IoT applications are likely to use. Ranging from lower-level internet protocols such as UDP and TCP through to the higher-level HTTP and the publish/subscribe MQTT. The output nodes are essentially the mirror images of the basic set of input nodes and provide a way to send data on the same set of protocols, i.e. mqtt, http, udp etc. The function category contains a variety of nodes that carry out specific processing functions. These range from the simple delay and switch nodes to the programmable function node that can be adapted to almost any programming need. 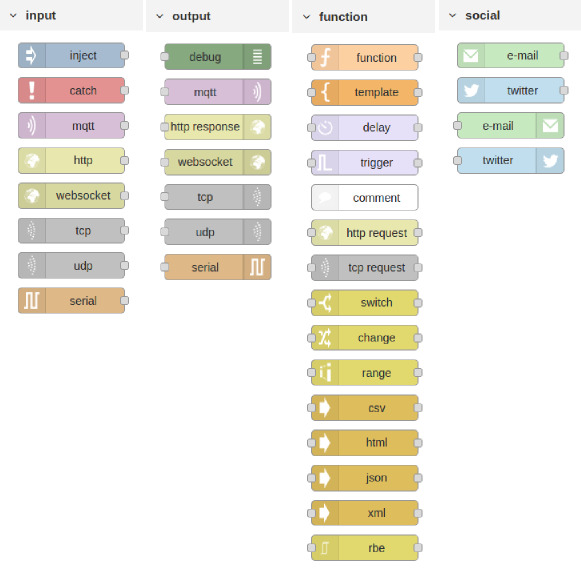 The basic social media nodes support interaction with email and with Twitter. They enable flows to send or receive email, or to send or receives tweets. The default node set for storage, because it is targeted at devices such as the Raspberry Pi are quite limited and focus on file based storage. Figure 4.2 The default storage, analysis, advanced and Raspberry Pi nodes. You should note that FRED, because it’s a cloud service, doesn’t support the basic file nodes. Instead it replaces these with a variety of storage nodes ranging from Mongo to Dropbox. However, for completeness the default nodes are covered here, so that you can use them, if you install Node-RED yourself (see lecture 7). file in Reads the specified file and sends the content as msg.payload, and the filename as msg.filename. Analysis nodes perform standard analyses on incoming messages. In the default node set, the only node provided is the sentiment node, which can be used to try and determine the sentiment of an incoming message based on the words used in the message, for example, an email or tweet. A set of miscellaneous nodes offering various types of functionality. watch Watches a directory or file for changes. You can enter a list of comma-separated directories and/or files. You will need to put quotes “…” around any that contain spaces. On Windows, you must use double backslashes \\ in all directory names. The full filename of the file that actually changed is put into msg.payload, while a stringified version of the watch list is returned in msg.topic. rpi_gpio in Raspberry Pi input node. Generates a msg.payload with either a 0 or 1, depending on the state of the input pin. You may also enable the input pullup resistor or the pulldown resistor. Requires the RPi.GPIO python library version 0.5.8 (or better) in order to work. rpi_gpio out Raspberry Pi output node. Expects a msg.payload with either a 0 or 1 (or true or false). Will set the selected physical pin high or low, depending on the value passed in. The initial value of the pin at deploy time can also be set to 0 or 1. When using PWM mode, expects an input value of a number 0 – 100. The FRED service adds a number of nodes to the standard default set. These new nodes, which have either been written for FRED or collected from the public repository, have been added, as they offer useful functionality that expands the capabilities of the vanilla node set. Note: these nodes are available in FRED by installing them using the FRED installation panel. For a quick example of how to install nodes check out this tutorial. As you will see, the majority of these additional nodes focus on services and capabilities that match well with FRED’s nature, i.e. a cloud-based service. In many cases they focus on using Node-RED for web based integration or to access enterprise level services. As you can see, the FRED service adds a large number of social media nodes ranging from Pushbullet to Slackbot to Instagram. dropbox watch Watches for file events on Dropbox. By default all file events are reported, but the filename pattern can be supplied to limit the events to files which have full filenames that match the glob pattern. dropbox out Dropbox out node. Uploads content to Dropbox. The filename on Dropbox is taken from the node filename property or the msg.filename property. You can pass in content either as a filename by setting the localFilename field or msg.localFilename property, or you can pass in content directly using msg.payload. MongoDB in Calls a MongoDB collection method based on the selected operator. Find queries a collection using the msg.payload as the query statement as per the .find() function. Count returns a count of the number of documents in a collection or that match a query using the msg.payload as the query statement. Aggregate provides access to the aggregation pipeline using the msg.payload as the pipeline array. MongoDB out A simple MongoDB output node. Can save, insert, update and remove objects from a chosen collection. Save will update an existing object or insert a new object, if one does not already exist. Insert will insert a new object. Update will modify an existing object or objects. mysql Allows basic access to a MySQL database. This node uses the query operation against the configured database. This does allow both INSERTS and DELETES. msg.topic must hold the query for the database, and the result is returned in msg.payload. postgres A PostgreSql I/O node. Executes the query specified in msg.payload with optional query parameters in msg.queryParameters. The queryParameters in the query must be specified as $propertyname. 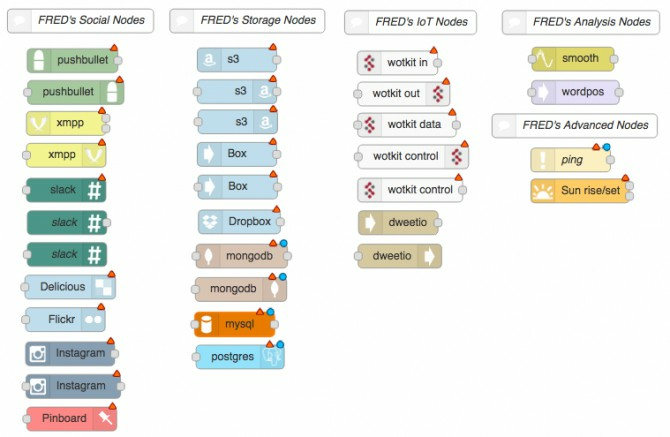 FRED adds a number of nodes to access popular IoT platforms, including Sense Tecnic’s Community edition of its popular IoT platform, WoTKit, and Bug labs’ dweet.io. wotkit out WoTKit output node to send data to a registered WoTKit sensor. The node will use the message.payload to create a data object. Optionally uses msg.thing to set the Thing ID, if not already set in the properties. The FRED platform only adds a limited number of analysis nodes as the default set is quite extensive. FRED adds the following advanced nodes. ping Pings a machine and returns the trip time in MilliSeconds. Returns false, if no response received within 5 seconds, or if the host is unresolveable. Default ping is every 20 seconds, but can be configured. sunrise Uses the suncalc module to generate an output at sunrise and sunset based on a specified location. Several choices of definition of sunrise and sunset are available. The first output emits a msg.payload of 1 or 0 every minute, depending if in between selected times or not. The second output emits only on the transition between night to day (-> 1) or day to night (-> 0). The following nodes are available in FRED and don’t fit into the basic categories that vanilla Node-RED provides. These include nodes to access and control Google services, enterprise nodes such as Salesforce access, nodes for accessing transportation API (e.g. Transport for London) and other miscellaneous nodes for access to weather services, etc. FRED supports several Google nodes to interact with a range of Google services. Google plus Interacts with the Google+ API to get information about people, activities, and comments. People – Allows you to interact with Google+ profiles. You can get a particular profile, search for a profile, or gather a list of people that have +1’d or reshared an activity. Activities – Allows you to interact with Google+ activities. You can get a particular activity, search for an activity, or gather a list of activities directly related to a person. The FRED fitness nodes cover a number of popular fitness devices. strava Get your most recent activity on Strava. Fitbit activities Retrieves user data from Fitbit and returns a msg.payload determined by nodetype properties (as fitbit in). 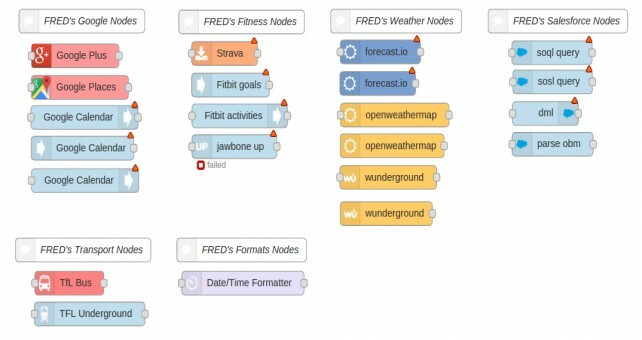 FRED adds a set of nodes to give access to a variety of weather services. A set of experimental SalesForce nodes are available with FRED. TfL bus Get live bus departure/arrival info for London (UK) buses and river buses. moment moment is a date/time formatter node that takes as input either a JS datetime object or a string that moment can resolve to such. If the input is null, doesn’t exist or is a blank string, the current date/time will be used. This can be used to add a current timestamp to a flow of any kind easily. In this lecture, you were presented with a summary of the default Node-RED nodes available on installation, and the extended set of nodes that FRED adds. As you have seen, there is a wide variety of nodes allowing you to build complex flows with little or no programming. You’ve also seen that not all nodes are always available, for example the Raspberry Pi nodes don’t work unless you are actually running Node-RED on a Pi. So it always pays to check that you can run the nodes you need in your environment. However, given the large number of nodes available, and the fact that the community is creating new nodes on a daily basis, you are likely to be able to find a node that meets your needs. If not, you can fall back on the flexible function node, or even create your own, something that will be discussed in the advanced lectures. About Sense Tecnic: Sense Tecnic Systems Inc have been building IoT applications and services since 2010. We provide these lectures, and FRED, cloud hosted Node-RED as a service to the community. We also offer a commercial version to our customers, as well as professional services. Learn more.